A little savory. A little sweet. Always well-seasoned. The culinary adventures of a small-town foodie. Although I have designated January my bread and soup month, I hardly find myself eating either on a routine basis. Part of what has made this challenge so great is not only learning how to make new foods, but stepping out of my comfort zone. I’ve only ever cooked clam chowder before (I am from New England, after all), and my go-to soups from restaurants include various versions of a potato soup. My favorite soup, however, has to be the creamy onion that Outback serves on a limited basis (bring it back, bring it back!). 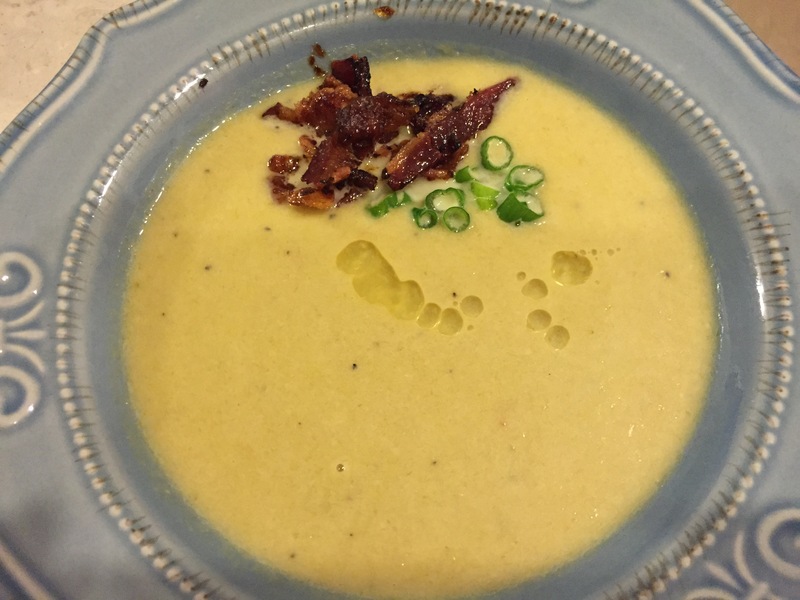 In that same vein, while searching for soups to make this month, I found a recipe for leek soup at How Sweet It Is that featured some of my favorite buzzwords: creamy, caramelized, bacon. I was sold. Also, I thought it would pair well with the sourdough bread that has been a week in the making. I really wanted all my foods to be as homemade as possible, so when I settled on baking a sourdough this week, I also planned enough time to create my own starter. Most people buy sourdough starter from the store, but you can create your own with some water, flour and time. The starter is a mixture of water and flour that you “feed” every day with more flour and water. As it sits, it begins to ferment. That’s where the sour taste comes from. I got tips from King Arthur Flour and Nourished Kitchen on how to create my own starter. 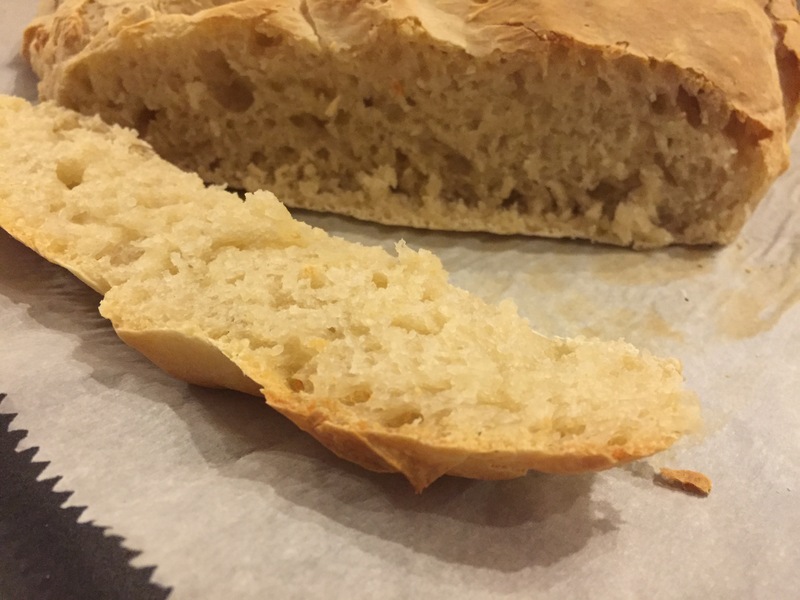 I also used King Arthur’s rustic sourdough recipe to build my bread. The site also offers tons of other recipes and helpful tips. I’ll admit I botched this recipe the first time around. I got so excited, I put the bread in the oven before giving it a second opportunity to rise. My second attempt was much better, although I was short on time, so it didn’t rise as much as I would have liked and was a little dense. Even still, it had the little bit of tang I was hoping for and paired well with my soup. 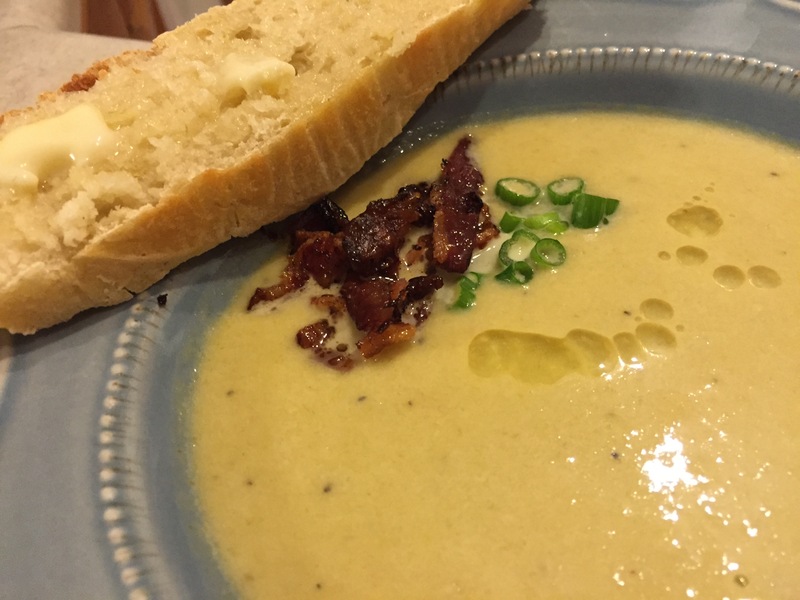 The creamy caramelized leek soup may be one of my favorite soups ever. Ever. I don’t use that word lightly. I blew through a bowl of this sweet, creamy soup in no time at all. Then I kept going back to the pot to dip my spoon in for just one more taste. Just one more turned into another and another. The soup was a little on the sweet side, mostly because I caramelized the leeks. Don’t worry, it wasn’t overpoweringly sweet. I made a couple of alterations to remedy this, so it still had a slight sweetness but less so than the original recipe. First, I added a little bit of lemon juice. Second, I recommend not coating the accompanying bacon in maple syrup. A traditional bacon crumble really complements the soup in a savory way. If you’re interested in either of these, I have linked to the recipes above. Check ’em out. No, really. I like to cook, write, read, sing in the shower and trick my dog into playing fetch with me. I am easily distracted by shiny objects, although I still believe in hard work (and unicorns).